Western blot analysis of extracts from HeLa cells, transfected with 100 nM SignalSilence® Control siRNA (Unconjugated) #6568 (-) or SignalSilence® Aurora A/AIK siRNA I (+), using Aurora A/AIK (1G4) Rabbit mAb #4718 (upper) or α-Tubulin (11H10) Rabbit mAb #2125 (lower). 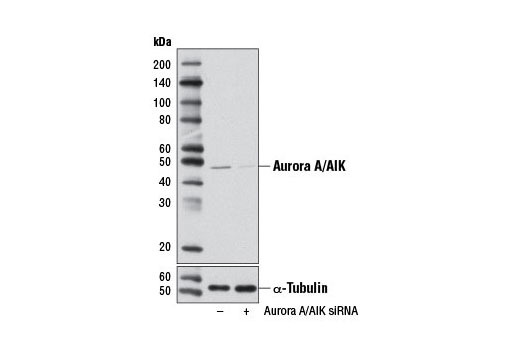 The Aurora A/AIK (1G4) Rabbit mAb confirms silencing of Aurora A/AIK expression, while the α-Tubulin (11H10) Rabbit mAb is used as a loading control. CST recommends transfection with 100 nM SignalSilence® Aurora A/AIK siRNA I 48 to 72 hours prior to cell lysis. For transfection procedure, follow protocol provided by the transfection reagent manufacturer. Please feel free to contact CST with any questions on use. SignalSilence® Aurora A/AIK siRNA I from Cell Signaling Technology (CST) allows the researcher to specifically inhibit Aurora A/AIK expression using RNA interference, a method whereby gene expression can be selectively silenced through the delivery of double stranded RNA molecules into the cell. All SignalSilence® siRNA products from CST are rigorously tested in-house and have been shown to reduce target protein expression by western analysis. Aurora kinases belong to a highly conserved family of mitotic serine/threonine kinases with three members identified among mammals: Aurora A, B, and C (1,2). Studies on the temporal expression pattern and subcellular localization of Aurora kinases in mitotic cells suggest an association with mitotic structure. Aurora kinase functional influences span from G2 phase to cytokinesis and may be involved in key cell cycle events such as centrosome duplication, chromosome bi-orientation and segregation, cleavage furrow positioning, and ingression (3). Aurora A is detected at the centrosomes, along mitotic spindle microtubules, and in the cytoplasm of mitotically proliferating cells. Aurora A protein levels are low during G1 and S phases and peak during the G2/M phase of the cell cycle. Phosphorylation of Aurora A at Thr288 in its catalytic domain increases kinase activity. Aurora A is involved in centrosome separation, maturation, and spindle assembly and stability. Expression of Aurora B protein also peaks during the G2/M phase of the cell cycle; Aurora B kinase activity peaks at the transition from metaphase to the end of mitosis. Aurora B associates with chromosomes during prophase prior to relocalizing to the spindle at anaphase. Aurora B regulates chromosome segregation through the control of microtubule-kinetochore attachment and cytokinesis. Expression of both Aurora A and Aurora B during the G2/M phase transition is tightly coordinated with histone H3 phosphorylation (4,5); research investigators have observed overexpression of these kinases in a variety of human cancers (2,4). Aurora C localizes to the centrosome from anaphase to cytokinesis and both mRNA and protein levels peak during G2/M phase. Although typical Aurora C expression is limited to the testis, research studies report overexpression of Aurora C is detected in various cancer cell lines (6). Warner, S.L. et al. (2003) Mol Cancer Ther 2, 589-95. Katayama, H. et al. (2003) Cancer Metastasis Rev 22, 451-64. Andrews, P.D. et al. (2003) Curr Opin Cell Biol 15, 672-83. Pascreau, G. et al. (2003) Prog Cell Cycle Res 5, 369-74. Crosio, C. et al. (2002) Mol Cell Biol 22, 874-85. Kimura, M. et al. (1999) J Biol Chem 274, 7334-40.